Colonel Bill Bower, now 94, is the last surviving Pilot of the 1942 Doolittle Raid on Japan. 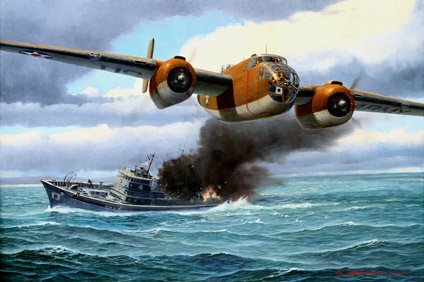 The B-25 Serial # 40-2278 was named "Fickle Finger" and was the 9th plane of 12 in the staggered row packed on the deck of the USS Hornet. According to Bower's mission report, after hitting their targets at Yokohama they strafed with .30 and .50 cal incendiary rounds a Japanese weather boat 100 miles east of Japan and left it burning and sinking.